Are you adrift in a sea of hair dryer uncertainty? Tourmaline, diffuser, ionic, ceramic, AC… what is all this mumbo jumbo? Well, we’ve waded through the muddle of marketing terms and done the hard hair dryer work for you. Welcome to our hair dryer guide, which contains everything you need to know about investing in the right hair dryer for you. Is there truly a difference between professional hair dryers and retail standard hair dryers? Start your engines because the main point of difference is the hair dryer motor. 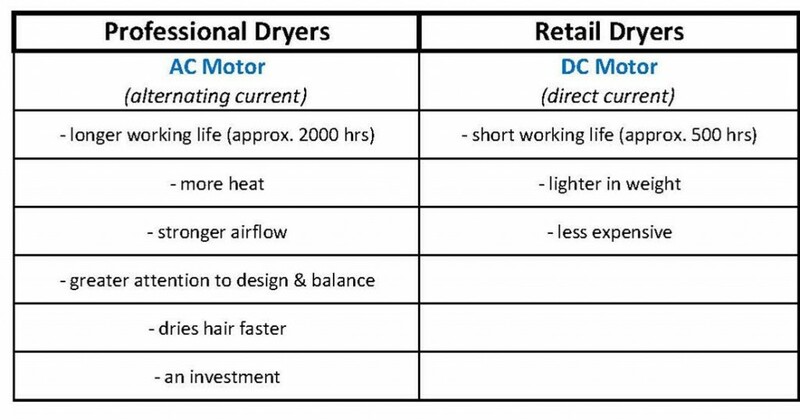 Professional hairdryers tend to have AC motors (alternating current), while retail hair dryers favour DC (direct current). AC motors are larger and operate with less RPM (revolutions per minute) which ensures the motor has a significantly longer working life. 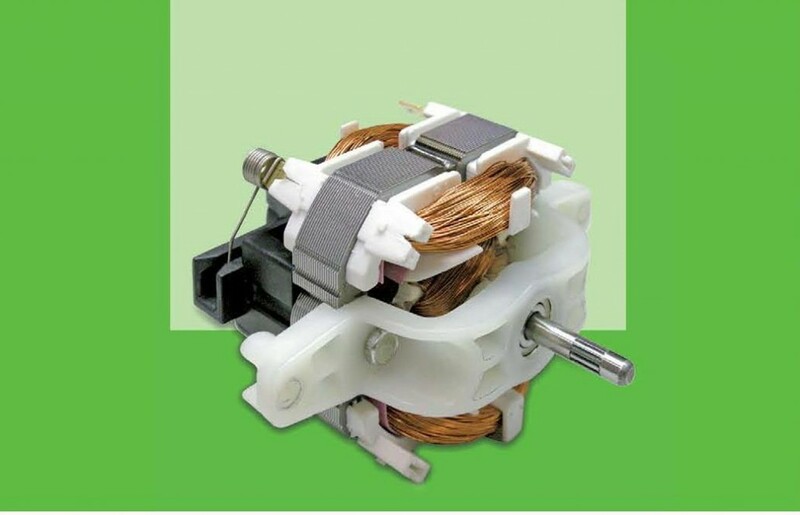 AC motors deliver more heat and a stronger airflow, while DC motors tend to be lightweight and less expensive. AC motors get the job done quicker, which is why professional salons use hair dryers with AC motors. If you have difficultly wielding a hairdryer or are on a tight budget, you may appreciate a lightweight hair dryer with a DC motor such as the ETI Turbo 3900 Eco Light Hair Dryer or the AbsolutHeat hair dryers. If you regard your hair dryer as an investment intended to last many years, turn to AC motors such as in Parlux hair dryers. Time for tech talk. Who knew the humble hair dryer could inspire so much terminology? Let’s start with wattage. Wattage refers to a hair dryer’s power. This is the current being drawn from the power point. As a general rule, the higher the wattage, the stronger the air flow and hence the quicker the drying time. Low wattage is best suited to blow drying fringes or thin and fine hair. 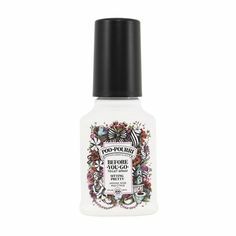 High wattage is best for curly and thick hair. However, wattage is only part of the hair dryer equation. Air flow, heat, blow-dryer design and technology combine for the total hair dryer picture. If a hair dryer has dual voltage, this means the hair dryer can be used almost anywhere in the world. Most commonly found in travel-sized hairdryers, dual voltages convert 110/120 V to 220/240 V, but you will still need a standard adapter plug to fit into the electrical socket for the country you are travelling to. 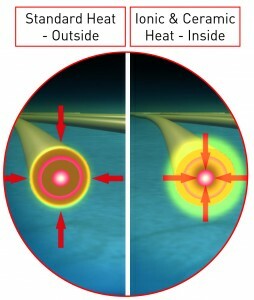 Multiple heat and airflow settings, and the cold shot button are all interrelated. These allow the hair dryer to adapt to different hair types and styling needs. For example, finer hair may require a lower heat setting while thick, unruly hair needs to be tamed with a high heat. Or if you are only styling your fringe you’ll need less heat and airflow than if you were drying off wet hair. The cold shot button helps seal your hair shaft, setting your style in place and adding shine. Many hairstylists will finish off blow-drying a section of hair with a blast of cold air whilst the hair is still wrapped around a round hair brush. Extra attachments for your hair dryer – diffuser for curls and concentrator nozzle for straightening. Then we come to diffusers and concentrator nozzles. Diffusers are used to enhance hair’s natural texture. Best for curly or wavy hair, diffusers work to soften the airflow so it does not disrupt the natural texture of your hair helping to prevent frizz. Concentrator nozzles, on the other hand, focus air flow for precise styling and smoothing, normally used for straightening or when performing a round brush blow-dry. 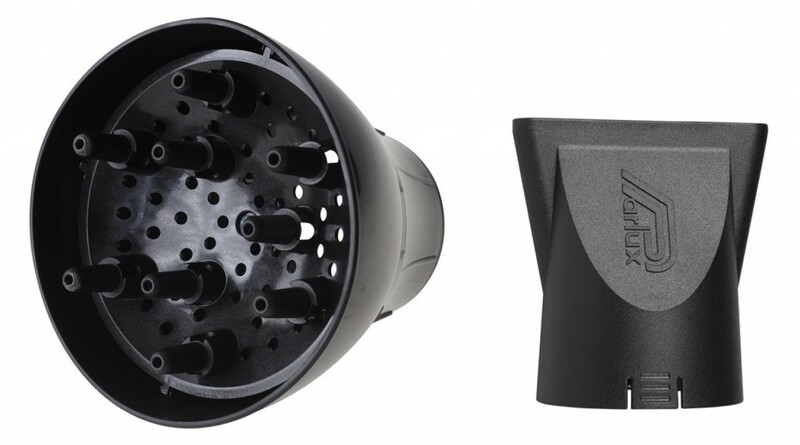 Both diffusers and concentrator nozzles attach to the nozzle of the hairdryer. If purchasing a professional hairdryer, a diffuser will often need to be purchased separately whilst most hairdryers will come with a concentrator nozzle. For a hair dryer with a concentrator nozzle and diffuser attachment included try, the Silver Bullet Supreme Hair Dryer range. Or for a travel hair dryer which includes a diffuser try the Silver Bullet Worldwide Cruise Travel Hair Dryer. Some professional hair dryer brands offer silencers, like the Parlux Melody Silencer which fits all models of Parlux hair dryers. A silencer simply reduces hair dryer noise, which may be a handy feature for early morning blow dries and salons. Ceramic, tourmaline and ionic technology are de rigueur in hair dryers these days. You may be more familiar with tourmaline in jewellery, as it’s a semi-precious gemstone. Tourmaline is also an ionic and infrared generator when heated as with ceramic. Negative ions released from heated tourmaline and ceramic, split water molecules which then evaporate faster, drying hair quicker and adding shine. Ionic hair dryers work on the same principle as tourmaline and ceramic, in that negative ions reduce drying time and seal in moisture, however if your dryer also has a separate negative ionic generator this magnifies the effect of ionic technology greatly. Ceramic technology distributes heat evenly, ensuring no hot spots which may damage the hair, and also gives off Far Infrared Heat Waves. These are longer heat waves that enable the hair to more easily absorb heat, drying from the inside. Titanium technology offers more durable and longer lasting components. 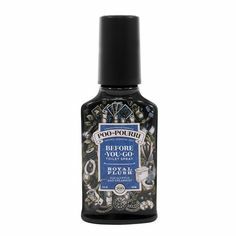 Zero corrosion. Titanium has the ability to be heated to extremely high temperatures very quickly, and heats extremely evenly. Hair dryers may have one or two of these technologies – tourmaline, ceramic, titanium or an ionic generator. To significantly reduce your drying time and create superior results, we recommend a hair dryer with tourmaline, titanium or ceramic technology as well as ionic technology (separate ionic generator) combined with high wattage. Look for a hairdyer with multiple speed and heat settings. Lower heat settings are safest for your hair. Ceramic or titanium technology will ensure no damaging hot spots, and ionic or tourmaline technology will help lock moisture into your hair. Lucky you, many hair dryers will suit. We recommend ionic, ceramic or tourmaline technology to smooth hair, locking in moisture and reducing blow drying time. Ceramic or titanium technology will also protect your hair from frizz and heat damage. 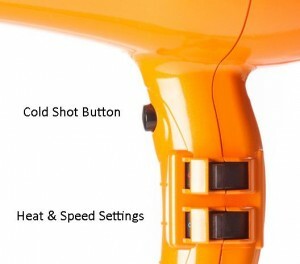 Try a hair dryer with a cold shot button to set your style. Look for a hair dryer with a high wattage to blow dry your hair quicker with more air flow. A hair dryer with multiple heat settings and a separate ionic generator will also be of benefit, as the higher heat settings will allow for powerful hair drying and the ionic generator will create a glossy, smooth finish. Go for a hair dryer with a diffuser to enhance your natural texture. 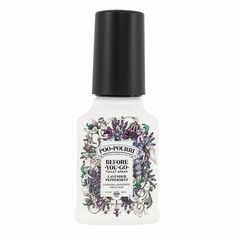 A diffuser will ensure bouncy yet defined frizz-free curls. Don’t forget a cold shot button to set your curls. If you’ve a fondness for smooth, sleek hair, look for a hair dryer with a concentrator nozzle to focus the air flow. A combination of tourmaline or ceramic technology, and ionic technology is best at delivering smooth, frizz-free results. At i-glamour, we run the entire gamut of the best hair dryers. From affordable, such as AbsolutHeat to the #1 professional hair dryer brand globally, Parlux. Other brands include Silver Bullet, ETI, and Elektra. Each and every brand has unique features and varying price points to suit all hair needs and budgets. Begin with selecting whether you prefer a professional hair dryer or a retail hair dryer; a decision usually made with budget in mind. Once you have decided that refer to wattage and technology to best suit your hair type. Consider the size of the hair dryers, such as whether you prefer a travel, compact or regular size. Consider whether you need a diffuser or concentrator nozzle. Lastly, don’t be afraid to inject a little fun into your styling routine by selecting a coloured hair dryer. We hope we have helped you navigate through the world of hair dryers. Connect with us via Facebook, Twitter, Pinterest, or Instagram and tell us which hair dryer you decided was the best for you, or if you have any questions about which dryer to choose email us directly!